WP Picture Calendar is a wordpress plugin that allows you to add new widget to Your sidebar. 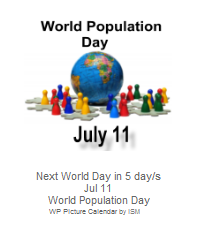 WP Picture Calendar shows a simple image calendar of World Days whith date and short description. With WP Picture Calendar you will not miss World Day anymore. 1. All of the photograph link (nofallow) to the relevant World Day pages , so anyone interested can learn more about the World Day shown. 2. Photo is described by a two-line description under the photo. 3. Plugin adds the contents with the best practices of SEO. 4. 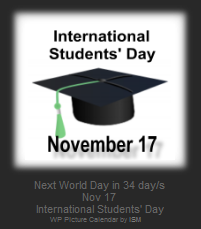 Widget shows current World Day or countdown to the next World Day. Sadly I couldn’t use the plug-in because the graphics overlapped each other. They looked squeezed, one on top of the other. I like the concept of this plug-in. However, I’d like to see an option to display the next world day on the calendar rather than a random day. That way we could always prepare for the next day coming up.